Then, Michelle @ Our Crafty Mom pushed the stakes even higher with her Beautiful Music Note Nightstand!! You all are some incredibly talented women! Now, for Theresa's Food Picks. Oh my! Only Two?! Okay, she just had to have this recipe!! 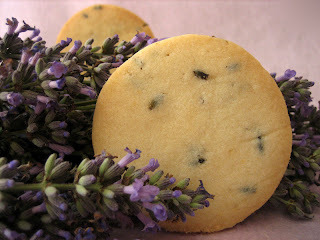 Pretty Shabby UK shared her recipe for these Yummy Lavender Shortbreads! If you haven't tried them before, Theresa says this is a great recipe! Cherishing the Sweet Life offered up this wonderful Easy Blackberry-Cinnamon Cobbler! Another recipe keeper! Linda's Picks?! Linda's DIY's include Gail at Purple Hues and Me's Wonky Foam Cup Vases! These were truly incredible, we've never seen anything like this before! 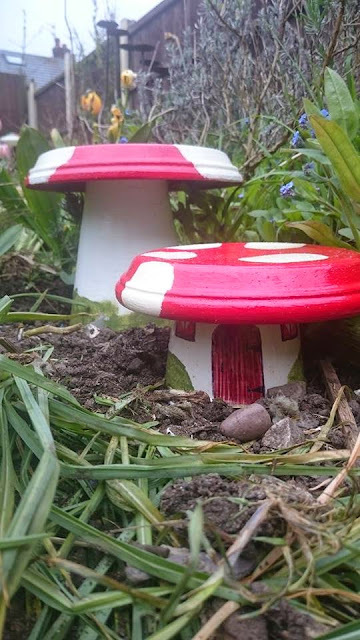 Linda also loves Pretty Shabby UK's Painted Toadstool Plant Pot Tutorial! Aren't they adorable?! And, for Linda's Food Picks?!! Linda loved Study at Home Mama's Plum Crisp! Yumm! Fabi Fufu offered up this wonderful and refreshing Watermelon-Lemonade Cooler that had us both running to the store! Make sure to pop over to Linda's @ Crafts a la Mode to see if you were her Bonus Feature this week! Dee, I am so glad you finally made it! Thanks so much for joining us! Have a wonderful weekend, as well! 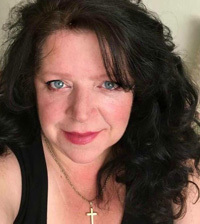 Hello Theresa, I found your lovely blog by accident, just surfing Blogland, and I realized I had see your beautiful work before on Hometalk. I am so glad I joined your link party! Hi Mary, Me, too!! I'm so pleased you found me and are linking up! Welcome!! 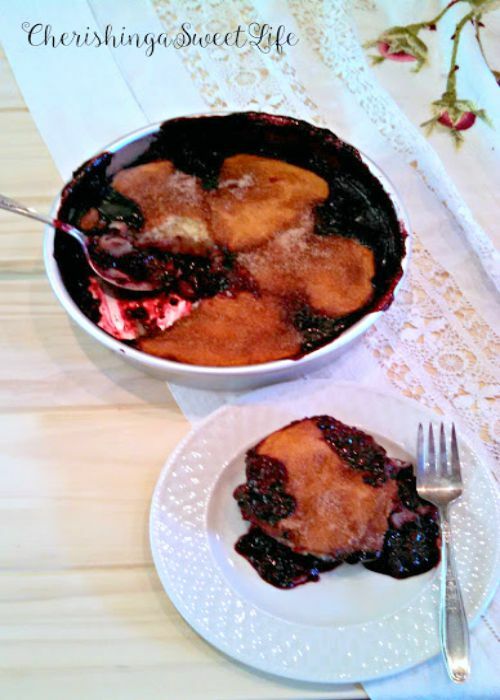 Thank you for hosting and for featuring my Blackberry-Cinnamon Cobbler, Theresa! All of the features are beautiful! :) Hope you have a lovely weekend! Thank you so much for featuring my side tables. I'm delighted you liked them (even without distressing)! :) This week I've shared another table and I did do some distressing on it! Thanks for the party each week. Thank you for the party! Hope you enjoy your weekend! Thanks, Laurie! Thank you for joining us, too!